Angel Number 98 is a communication from the guardian spirits that you should concentrate on your spiritual objectives in life. The divine angels are asking you to accomplish your real purpose of existence as per divine intentions. You should have belief in your talents and skills to follow the spiritual journey with passion. This will guarantee that you will be triumphant in materializing your ambitions and aspirations in life with the grace of the angels and celestial forces. Angel number 98 meaning says that you should not be held back by the past events and accept the new transformations with zeal and objectivity. These new changes will alter your life in a constructive and profitable manner. Angel number 98 symbolism amalgamates the vibrations and qualities of Number 9 and Number 8. Number 9 contributes its forces of completion and finishing of events, spirituality and principles of spirituality, divine intentions of life and the real purpose of existence. The number also has the characteristics of constructive leadership in society, sixth sense, charity and social service, kindness and goodwill. Number 8 has the attributes of Karma and its principles of action and response, realization of riches, affluence and opulence, generosity and acceptance for charitable purposes. In addition Number 8 signifies the energies of accomplishment in life, capabilities and aptitude, mental strength and innate intelligence, stability and consistency. 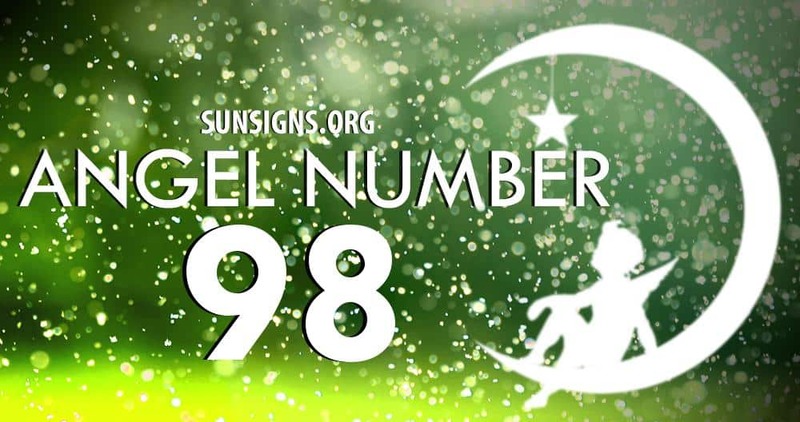 Angel Number 98 symbol by frequent appearance in your life gives an indication from the angel numbers that an important sequence of events or succession of things is coming to a close. This will entail far reaching effects on various other aspects of life. The termination of these events will bring with it fresh openings in your life which will lead to many advantageous prospects.